DID YOU KNOW: that 90% of the world’s data was generated in the last two years? Data is being produced at a phenomenally rapid rate. 2.5 quintillion bytes of data are created every day and there is no intention of slowing down. In fact, with the proliferation of smart devices, 3.5 billion daily Google searches, the popularity of social media and the growth of the Internet of Things (IoT), the pace of data generation is set to soar. Connected technologies are radically transforming businesses and industries on a global scale. This means data acquisition has become invaluable to organisations. Whether it’s improving the customer experience, mitigating risks, or optimising operation, data allows businesses to make accurate, well-informed decisions to help meet their bottom line. With the rising volumes of data exchanged and increasing numbers of networks, the demand for higher speeds and the density of equipment are vital for having more reliable, secure, and high performance electrical and digital building infrastructures. When describing the performance of a structured cabling system, irrespective of the technology used for the conductor, the transmission speed is the reference point. The system has been designed to create customised solutions for you. These solutions enable you to look ahead, as they facilitate all maintenance operations. Patch panels and fibre optic drawers have been completely renovated and redesigned to increase the number of connectors and simplify installation. The LCS3 range is equipped with tool-less connectors that can cope with the most critical environments, with copper solutions as high as Category 8. It also includes a considerably expanded fibre optic offer, allowing speeds up to 100 Gbps. As well as innovations in terms of ergonomics, Legrand’s structured cabling solutions are modular, easy to install and optimised for easy maintenance. More efficient, scalable and higher performance, LCS3 satisfies the latest requirements of LANs and data centers! 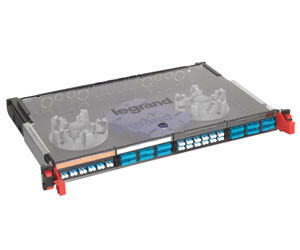 From control and connection interfaces, to cable management, energy distribution and data distribution systems, Legrand provides a host of solutions to manage lighting, energy, networks and building access. Through this integration of operation, innovation, ergonomics and elegance, Legrand rises to the challenge of developing product lines that will continue to enrich its customers’ lives into the future.